Spring forward! The clocks went forward one hour on Sunday morning, we're officially in summertime now, and oh it felt like it this weekend... On Sunday, temperatures reached 18-20C and I think all of Ireland was out in the fresh air and sunshine, astonished and delighted, whether planting spuds or licking ice-cream cones or thinking about jumping into the Forty Foot. Lots of happy heads around the place. And look at this beautiful blossom, sent to me by a friend (you have to love those smart phones); thanks for the lovely photo LB. Here's a less skilled photo, but it was taken from the bicycle, in a rush as about 20 Italian teenage students were about to walk into the frame, chattering loudly and happily, none of them glancing up at the delicate perfection above. This tree is a favourite of mine and I cycle a different route at this time of the year just so I can see it. It looks just perfect for about a week at most and so doesn't meet the requirements of the trees that many will recommend for small gardens--multi-season interest and so on--but really, wouldn't you have it in your garden just for that one week of perfection? It was all about the plants for me this week. The horse chestnut is making the most of the early spring warmth, galloping along from sticky buds I showed here a few weeks ago to limp-wristed lime green this week. In the woods in our park, wild white wood anemones and what I suppose are garden escapes (fancier blue ones) are in bloom. In the early morning when I took these photos, there wasn't yet enough sunlight to coax them into opening up. A short while later though, I know they would have been persuaded: petals flared open like the flung apart limbs of a sleeping baby. The false spikenard in the back garden (Smilicina racemosa, although I think it has been re-named recently) is growing almost before my eyes now, each evening the tight buds have pushed a bit higher above the ground, uncrinkling as quickly as they can once they reach about 8cm or so. In May (or even earlier this year, at the current rate of knots) each stem will carry a frothy head of creamy blossom which will delight us with a beautiful scent on early summer evenings. For now, we're more than happy to have the gorgeous Spring perfume of narcissi in the front garden. The greenhouse is getting to be a busy place - the tomato seedlings are doing okay so far, although the <expletive deleted> slugs got one or two of them; the basil seedlings have moved from a windowsill into the glasshouse too and are getting their first true leaves; the lettuce is safe from the slugs so far and I've also got Cosmos and Nicotiana seedlings on the go, which feels nicely frivolous. 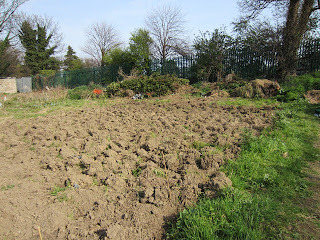 But the real action this week was up at the allotment. My son has done mighty work up there, turning very heavy clods of clayey soil and scutch grass, preparing the way for the rest of us (thanks DM!). So there we were on Saturday: a meitheal of us bashing clay off clods of old scutch grass, building frames for raised beds, sifting through the soil for the dreaded white roots that'll spring into a million more scutch seedlings, and--at last--planting some potatoes! Sharpe's Express: earlies. I've never grown spuds before but as they form one of my earliest gardening memories--watching my Da dig them up and then the wonder at how different they tasted--I'm keen to give them a go. On Sunday the work continued and I planted some red onions. 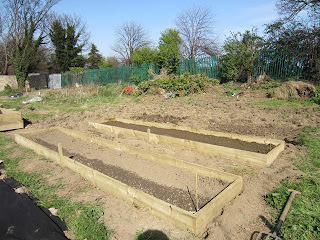 There'll be broad beans, runner beans and peas of different types too I hope, over the next few weeks. Many thanks to all the helpers - you know who you are: I'd be lost without you all. Here's how the allotment is moving from weedy wilderness to something that may provide us with our very own homegrown produce. Oh no... on this we're going to try to grow vegetables? 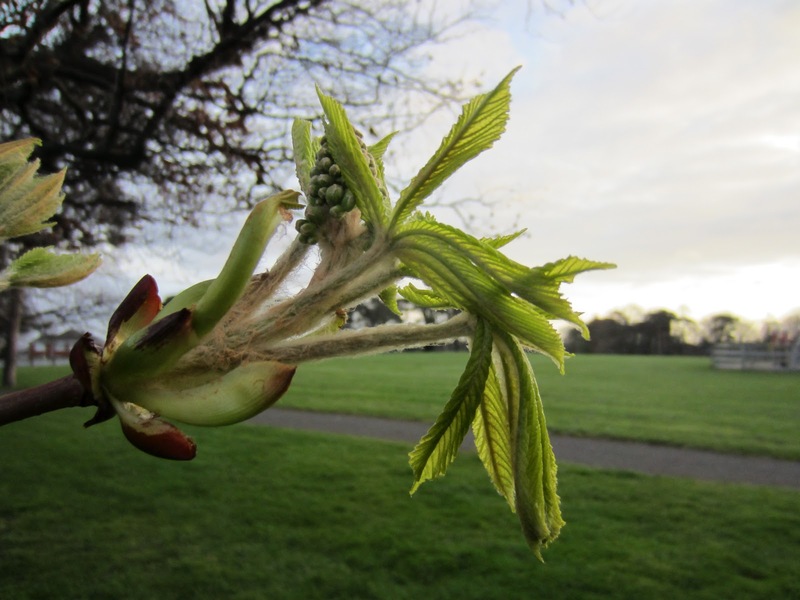 Unfurling like a spread-eagled infant...love that. Also enjoy the sequence shots. Kindly continue. thanks for the kind words! glad you're enjoying the sequences. keep an eye out for some lovely Japanese Maples, coming soon to a blog near you.